Thank you very much for showing faith in me for astrological consultation regarding the "most important task" in a person's life, i.e. pro-creation. The time of conception ("Garbhadhaana") is very important and should be carefully planned. I hope, you have already gone through my detailed article on this subject. You should choose a date for nuptials and try for conception when 'Vjyotish indices' of both of you are highly positive, or at least, the index of your husband is positive. It will ensure that all possible good cosmic vibrations are centered such that the energy generated would nullify all other unfavourable factors and enhances the chances of success of the effort. A person is thus enabled to remove, neutralize, counter-act or overcome the evils indicated by his/her horoscope. It will enable you to bear "Virtuous and healthy child" instead of just bearing a "Child" only. Of course, it is not always necessary that your biological reproductory cycle coincides with the best dates indicated by your or your husband's Vjyotish indices. Therefore, I have computed "Best possible astrological dates" during the next 365 days, for you and your husband, both. You will most probably find some common dates in the following tables which coincide with your biological cycle too. The minimum and maximum theoretically possible astrological values for "Suitability index for efforts to conceive a virtuous child" are -770 and +770 respectively. 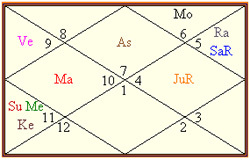 However, husband's Vjyotish index oscillated between -292 and +292 only during the analyzed period. Here in below, follows the category-wise break-up of various dates against the back-drop of husband's Vjyotish index values. No date was found qualifying for this category during the analyzed period. As already mentioned above, the minimum and maximum theoretically possible astrological values for "Suitability index for efforts to conceive a virtuous child" are -770 and +770 respectively. However, wife's Vjyotish index oscillated between -242 and +242 only during the analyzed period. Here in below, follows the category-wise break-up of various dates against the back-drop of wife's Vjyotish index values. Fifth house is traditionally the house of children. It represents our capacity to have children and shows the kind of relationship we will have with them. This is the house of “generation” (the act or process of bringing into being; production or reproduction). Our progeny (sons & daughters) are signified by this house. A planet is capable of bestowing certain benefic and malefic results depending upon the "Quantum of authority" over concerned house (read, 5th house) due to various portfolios (of varying caliber) acquired by it in relation to that house. The more authority a planet has got to influence a house, the more it will deliver to the house from its natal promises, at appropriate moments. Further, "inclination" of that planet towards the concerned house determines the "Type of results" (Good or Bad). I have developed my own proprietary software (for personal use only) through which almost all major and minor factors, in proportionate ratios of their importance, can be been taken into consideration, simultaneously, to calibrate this "authority" and "inclination" index to gauge the planet's overall direct and indirect influences on the concerned house. During the process of trying to conceive, you (wife) must avoid all such things which are related to the planet which is "ill-inclined" towards your (wife's) 5th house. Towards your 5th House, the most ill-inclined planets are Saturn and Ketu, respectively. Both of them are also having high quantum of authority concerning matters related to the 5th house. Actually, Saturn is the Lord of 5th house itself. It makes them even more dangerous. You must avoid using bed-sheets and dresses of the colours governed by Saturn and Ketu. You should also not keep anything on your person or near you which represents these ill-inclined planets. Black, dark brown, chocolate, dark blue, indigo, grey, slate, darkest, shades of all colours, dull Colours. Saturn represents "Iron" and "Steel" and any thing which is "Black" in colour. It also represents anything old or dirty, ashes, agricultural tools etc. Therefore, remove anything near you which is either "Black" or made of steel" or "junk". Even if a "sacred thread" is black in colour, I would advise not to wear it. Ketu represents all mystical objects (amulets, talismans, shamanistic tools etc.). Wearing all such things will be harmful to your 5th house ("Children") related matters. Do not wear Blue Sapphire or Cat's Eye, if you want to conceive and deliver a healthy baby. 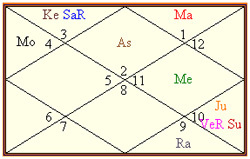 Though it may seem awkward to many astrologers because Saturn is your 4th and 5th lord and Ketu is posited in the 5th. Both of them should normally be considered highly auspicious planets in normal circumstances. Charity is *always* a good thing. If you engage in enough charitable giving, you can probably offset almost any bad Karma seen in your chart. The Vedic tradition also delineates classes of people and classes of animals who are the ideal recipient of your charity. This maximizes the effects of your charitable giving. You are advised to following remedial measures to appease Saturn and Ketu. Direct your charitable nature towards servants and laborers of any kind, farmers or gardeners, gerontologist (experts in ageing), monks or other reclusives, time-keepers, mine or mineral workers, incarcerators and prisoners. Give to charity on Saturdays (sunset if possible) to strengthen the results. Beware of narrow-mindedness, rigidity and over-conservatism. Be respectful of people in service or labor positions. Feed dogs with sweet "Parantha" made of mustard oil on every Saturday. What should be donated in charities? Blue or black silks (or black cloth), foods made with sesame seeds (black-til) or black grams (like 'Urad'), minerals or chemicals (iron, chains, fuel etc.) or items made of clay or leather, Horse bean, Musk, Black cow, buffalo, Shoe, Oil. Direct your charitable nature towards minority outcasts, homeless people, the mentally retarded, insane or ingenious people, those suffering from un-diagnosable diseases, philosophers, saints, mathematicians or scientists. Give to charity on Tuesdays (night if possible) to strengthen the results. Beware of any mind-altering drugs and self-defeating activities. Keep a healthy spiritual outlook and respect spiritual knowledge. Offer some food to a stray dog. Serve/help persons working for spiritualism. Mole, Seven grains, 7-corns, Coconut, Goat, Arms, Mustard oil, Brown cloth, multi-colored silks or clothes, foods made with horse grams, spiritual books or courses, knowledge of the unknown which is beyond boundaries of perception. However, if you wish to have exact intra-day time slots, calculated for your present geographical coordinates and time zone, for all dates during the considered duration, there is another supplementary report available. This report is not part of the present report and is needed to be ordered separately. In this report The best possible dates, during the considered duration, are suggested as per wife's horoscope, considering the cumulative beneficence levels of her 5th house, 5th lord and the Jupiter. Jupiter is the "Karka" for children. The Fifth house is traditionally the house of children. It represents our capacity to have children. This report is primarily based on Ashtakvarga transits in wife's chart. (These dates are already suggested in currently sent report too). Keep me updated with the developments. Thank you for the report. I hope to use the dates you have provided. After looking at the report, one issue concerns me. If possible, can you please elaborate on the topic you have mentioned about Saturn being the lord of 5th house, and Ketu in the 5th house. Is this placement harming my future pregnancy? Everything in you report is very clear and informative. I hope to continue to use your service in future.